Women had been working for decades to win the franchise. They had to organize in each state because the U.S. Supreme Court took the phrase "all men are created equal" literally. It ruled that protection under the U.S. Constitution did not include women. In response, suffragists began a nationwide campaign in 1848 to win their basic civil rights, which did not reach its goal until August 1920. Supporters had only eight months to organize their campaign to win voter approval. As the general attitude of the public toward women voting was more "amused, indifferent and incredulous" than hostile, wrote suffrage leader Louise Wall, "it seemed best for us to put forth positive arguments of a hopeful, constructive sort rather than arguments that ended in criticism or irony." Suffragists spoke to voters in the streets and from automobiles. They held mass rallies, picnics and small meetings. They addressed congregations, unions, factory workers, women’s clubs and any audience they could find. "I appeal to you as a mother, a grandmother, as a garment worker, a school teacher, a trained nurse . . . as the case might be," was one of the most popular opening lines when addressing a crowd. Experienced speakers from other states came to work alongside local women, and supporters across the country contributed funds. Just before the election, 10,000 people gathered for a final "monster rally" in San Francisco, which was followed by fireworks and a band concert. But on Election Day, October 10, 1911, the measure was soundly defeated in the San Francisco Bay Area and just barely passed in Los Angeles. Disheartened and disappointed, suffragists began to plan yet another campaign when late reports from the far flung counties began to swing the vote in their favor. The National Women’s History Project has reprinted Bertha Boye’s beautiful "Votes for Women" poster to honor the 100th anniversary of women winning the right to vote in California. On October 10, 1911, California became the sixth state where women could vote equally with men, nine years before the 19th Amendment enfranchised women nationally. 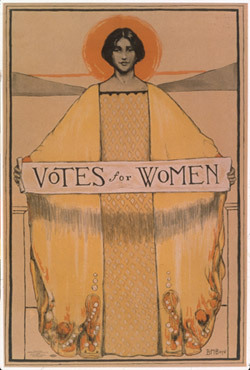 The poster’s vibrant colors and evocative imagery helped draw attention to the suffrage measure, which was one of 23 propositions on the ballot. For an entire week in August, stores in San Francisco featured the colorful poster in their windows, often accompanied by festive decorations in suffrage yellow, which supporters referred to as "the color of success."